We invite you to contact the Admissions Office and join us for an initial tour. 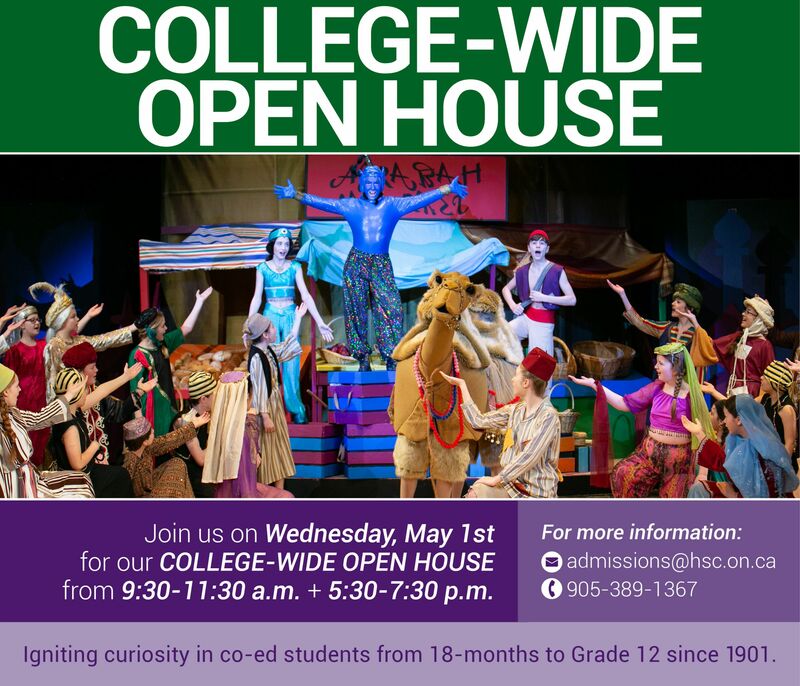 There are also multiple open house dates scheduled throughout the year. You will be prompted to login or create a MyHSC account, if you are a new family to HSC. Once you have completed your application you are required to pay, via credit card, a non-refundable $150.00 application fee. You will then review and submit your application. Upon receipt of your application, a representative from the HSC Admissions Office will contact you to answer any questions, book a visit day or arrange a Skype interview, and confirm required documents. On your visit day, applicants entering Junior School (Pre-Kindergarten – Grade 4) will be invited to attend an assessment time in a classroom setting, potentially with a small number of other applicants for the same grade. Montessori applicants will be invited to visit the Montessori School on a regular school day at which time they will be observed in the classroom setting. The applicant will then receive a timely notification of the admissions decision. When the applicant is offered a place at HSC, an enrolment package will be issued. To secure the applicant’s place, all forms must be completed and returned within seven (7) business days and include payment for a one-time non-refundable registration fee of $2,000. In keeping with HSC’s commitment to personal learning, we ask prospective students entering Grades 5 through 12 to submit a digital portfolio with three (3) samples of preferred exemplary work. One piece must include a writing sample with a minimum of 150 words. The submissions may include original works created by the student: artwork, elegant computer code, photography, an impressive math test, a unique movie or song, or something else that speaks to the student's skills and interests. Please submit the digital portfolio to admissions@hsc.on.ca using the applicant’s name as the subject title. Attachments may not exceed 25MB. If a video or audio creation is being submitted, please post it on a third party site such as Vimeo, YouTube, SoundCloud, etc. and send us a link to it. A member of the HSC Admissions Team will coordinate any required entrance test. All eligible incoming Grade 9 students sit the HSC entrance scholarship tests in lieu of regular entrance tests during this time.